I was recently contacted by relatives of one of the most memorable people we met on our year-long trip, David Menaker from Haines, Alaska. They wanted to let me know that David passed away last spring. As his daughter, Natasha, said, "He was such a wonderful man. I am glad you had a chance to know him." On July 5, almost three weeks after we’d boarded our first ferry in Prince Rupert, Canada, we arrived at our final stop on the Marine Highway, Haines. There we spent a delightful few hours gabbing and tasting wine at Great Land Wines, Ltd. The vintner, Dave Menaker, has lived in Haines for fifty years, and greets guests in a heavy pullover work shirt, jeans, and work boots. He also operates a sawmill out back, hopefully not running both businesses at the same time. Dave’s establishment proved a stark contrast to the wine tastings we did in Napa only a couple of months before, which were complete with waitstaff in formal attire attending to the hordes of tourists. Here, we were the only ones in the joint and the generous samples flowed free and wild – onion, potato, blueberry, raisin, rose petal, and dandelion wines were just a few of the selections, with Triscuits proffered for palate cleansing. David's ex-sister-in-law, Phyllis (David's mother was also Phyllis' first grade teacher. 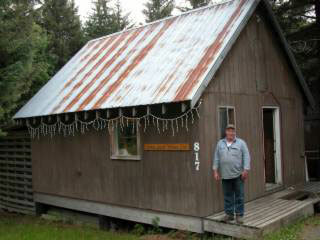 As she says, "Haines is a small place"), told me, "He was the same up to the end. Wonderful person, and we are all better people for knowing David," ending with, "Take care and don’t forget to enjoy life." This page contains a single entry from the blog posted on March 16, 2009 2:30 PM. The previous post in this blog was Island Life. The next post in this blog is A Wild and Crazy Group!.